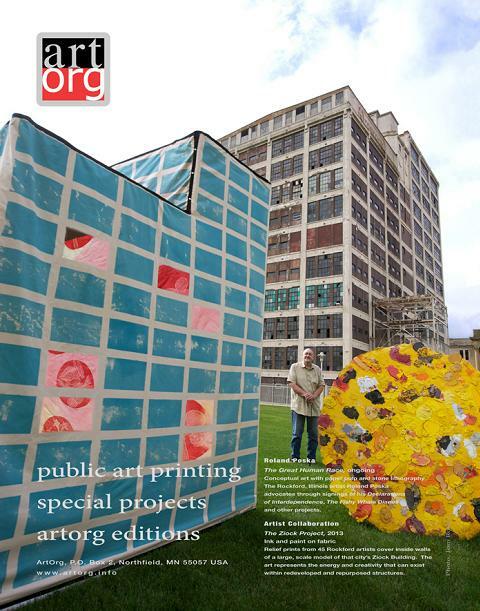 On the 4th of July 2012, ArtOrg traveled to Rockford, Illinois to take part in artist Roland Poska’s annual event for signing “Declarations of Interdependence”. 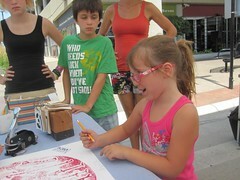 We performed our small steamroller printing event, at the corner of State and Main, and 45 kids and adults made wonderful paper prints despite some very hot weather. We saved the printing blocks that they created, reprinted the blocks, and placed those reprints inside a 9-foot-tall model of Rockford’s Ziock Building, and unveiled the so-called “Ziock Project” the next year on July 4, 2013 also at the corner of State and Main. We suggest that this “Ziock Project” and the art contained within represent the creativity and vitality that could exist within a redeveloped industrial and commercial buildings. ArtOrg has reprinted blocks before from these small steamroller printing events, but this is the first time we have been put together a three-dimensional structure. Thanks to the 45 print artists themselves for their drive and passion in creating outstanding works. Thank You! 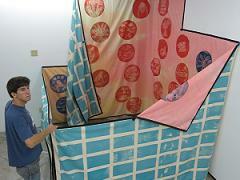 Large relief-printed fabric over three-dimensional frame.